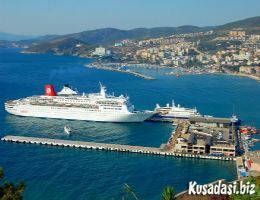 Kusadasi is a resort town on Turkey Aegean coast and the center of the seaside district of the same name in Aydın Province. Kusadasi lies at a distance of 95 km (59 mi) to the south from the regions largest metropolitan center of izmir, and 71 km (44 mi) from the provincial seat of Aydın situated inland. Its primary industry is tourism. Her neighbours are Germencik district from northeast, Söke one from southeast, Aegean Sea from west and Selçuk district from north. The name comes from kus (bird) and ada (island) as the peninsula has the shape of a birds head (as seen from the sea). During Byzantine times, it was known as Ephesus Neopolis; under the Genovese and Venetians, Scala Nova or Scala Nuova. Kus-Adasi was adopted in its place at the beginning of the 20th century. 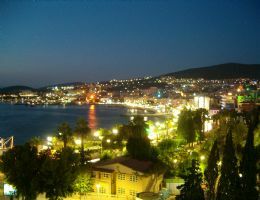 Today, citizens of Kusadasi often shorten the name to Ada. The area has been a centre of art and culture since the earliest times and has been settled by many civilizations since being founded by the Leleges people in 3000 BC. Later settlers include the Aeolians in the 11th century BC and Ionians in the 9th century. 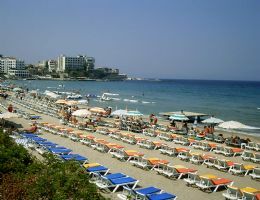 Originally seamen and traders the Ionians built a number of settlements on this coast including Neopolis. An outpost of Ephesus in ancient Ionia known as Pygela (Πύγελα), the area between the Büyük Menderes and Gediz rivers, the original Neopolis is thought to have been founded on the nearby point of Yılancı.Burnu. Later settlements were probably built on the hillside of Pilavtepe, in the district called Andýzkulesi today. Kusadasi was a minor port frequented by vessels trading along the Aegean coast. In antiquity it was overshadowed by Ephesus until Ephesus harbor silted up. From the 7th century BC onwards the coast was ruled by Lydians from their capital at Sardis, then from 546 BC the Persians, and from 334 BC along with all of Anatolia the coast was conquered by Alexander the Great. From then onwards the coastal cities were the centre of the mixed Greek and Anatolian culture called Hellenistic. The Roman Empire took possession of the coast in the 2nd century BC and made it their provincial capital and in the early years of Christianity. St John the Evangelist and (according to Roman Catholic sacred tradition) Mary (mother of Jesus) both came to live in the area, which in the Christian era became known as "Ania". Later the port was a haven for pirates. As Byzantine, Venetian and Genoese shippers began to trade along the coast the port was re-founded (as Scala Nuova or Scala Nova - "new port"), a garrison was placed on the island, and the town centre moved from the hillside to the coast. Old houses near the seafront, some of them converted to bars and cafes, are the remnants of old Kusadasi , which has become a modern-European looking town. The hills behind are built up with big hotels and blocks of holiday flats. The building boom in the late 80s and onwards has been continued into the hinterland of Kuþadasý.